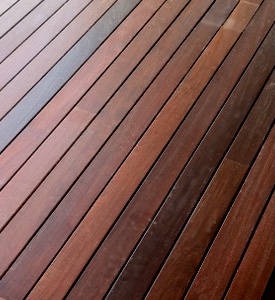 Ipe To Go carries a complete line of Ipe decking and Cumaru decking in all stock sizes. From time to time, we will buy overstock of other tropical decking products like Tigerwood and Massaranduba in limited quantities. We can provide additional decking for your project which is already underway, or we can be your single source solution for your complete decking project. From decking boards, posts, and fascia to clips, fasteners, end sealant and oil, we can provide the complete spectrum for your deck and deliver it to the job site. We offer all our decking products as moulded, not finished, products (see sidebar for more details) that are surfaced on four sides (S4S) and eased on four edges (E4E) in a variety of lengths and widths. Sanding is available at an additional charge. Our decking can be purchased by the piece to supplement your current project or bought as a complete package with or without accessories like fasteners and finish. Browse our site to learn more about tropical decking (Ipe decking and Cumaru decking) or submit a request below for a quote, and we will get back to you with availability and shipping quotes. We announce special deals first to our email list subscribers, so join today! The hardness of Ipe makes installation a bit more eccentric as Ipe can wear out a drill and break drill bits. It's always a good idea to have extra bits and either extra drill batteries or a good old fashioned corded drill on hand. A good rule of thumb is to plan on the install of an Ipe deck to take twice as long as a Pressure treated lumber deck. This is probably a bit too liberal, but that way you can finish within your forecasted time. IpetoGo.com is a subsidiary of HardwoodtoGo.com. We ship nationwide.